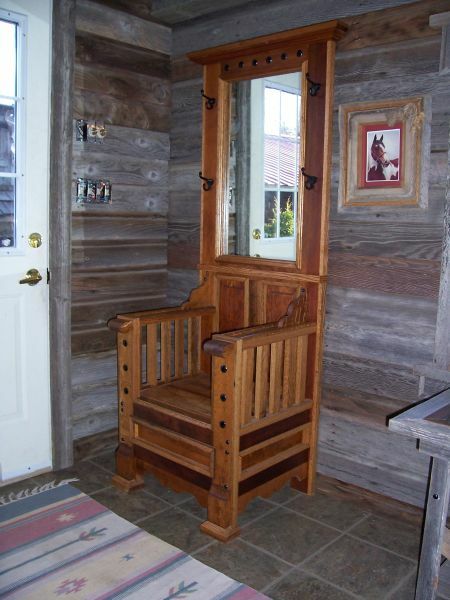 All furniture is built from fir lumber salvaged from early pioneer-era homes. It consists mainly of baseboards, rails and stiles from fir doors and stair treads. Old finish is removed and then planed to required thickness. In the case of painted surfaces the wood is used as salvaged with crackled finish intact. This wood is anywhere from 70 to 110 years old and is an attractive tightly grained wood and very hard. Designed and built by Wayne, all are one-of-a-kind pieces. Garden benches and tables are also available. Constructed of oak, maple and fir salvaged from a 1900's era farm home. Seat lifts and folds to reveal a large storage area for toques, gloves and scarves. Acorn coat hangers and hinges are actual period hardware. The mirror is also salvaged and has wear marks on the silvering due to age and use. 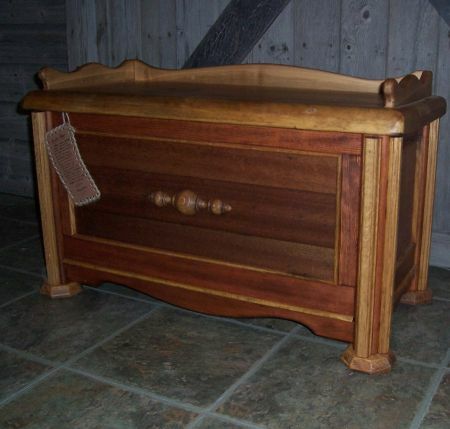 The top of this chest is maple salvaged from an old chest of drawers. 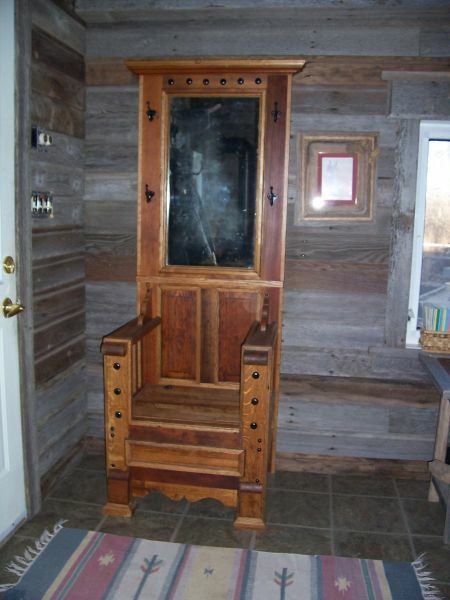 The body is salvaged fir, trimmed with oak. Front and side panel inserts are mahogany salvaged from the frame of an old settee. 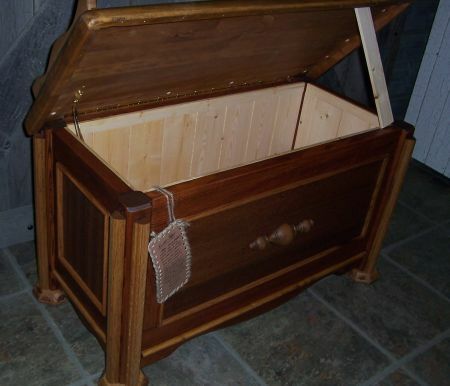 The lid has a self-supporting hinge and the interior of the chest is lined with fresh pine for hygienic purposes. This is a unique piece of furniture made from a 1920's cast iron school desk. 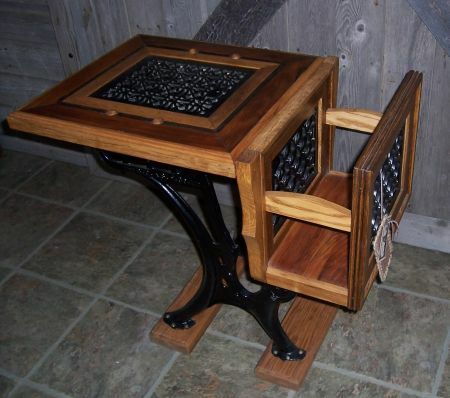 The table top and magazine holder are cast iron furnace grates from an old home heating system. Wood is early 1920's oak, fir and maple. 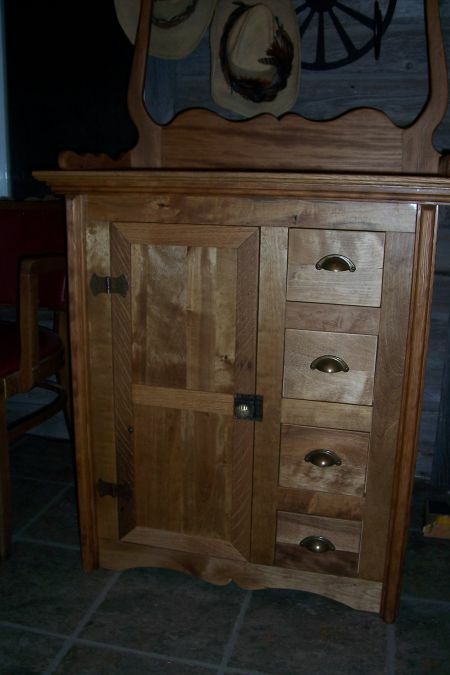 The wood for this cabinet and hutch was salvaged from an early 1920's farm home two miles west of Dysart. The owner had graciously allowed me to salvage what I wanted. It is constructed from 9" baseboards and the upstairs stair treads from this home. The glass door knobs were given to me by my son and daughter-in-law who were renovating their recently purchased home in Calgary which was built in 1930. Solid fir. 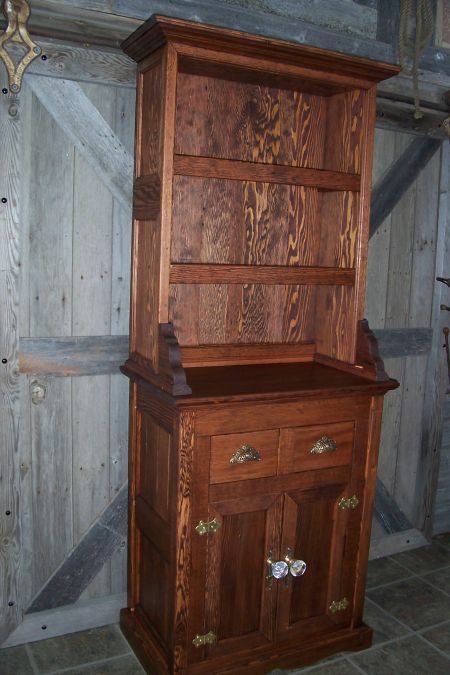 The top of the washstand is maple salvaged from a workshop on a vacant farm. It had been used as a workbench and was in fairly bad shape. The underside was in decent shape and was worth saving. 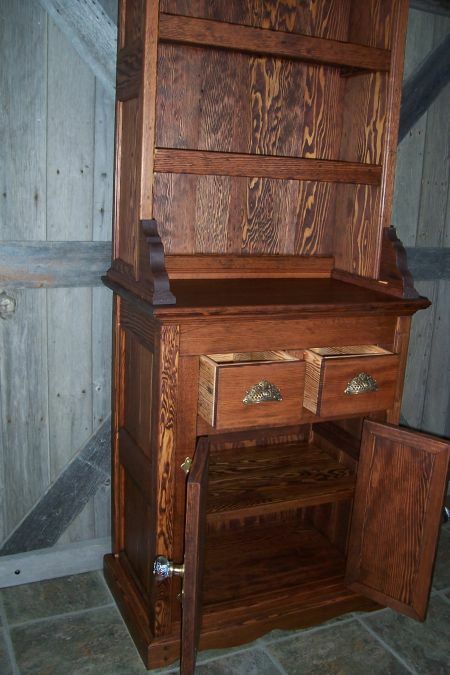 The majority of the washstand is maple salvaged from many different sources. Side panel inserts are fir and there is also a small amount of oak. The harp was designed and built of fir. The door latch is period, salvaged from a vacant farmhouse built in 1900. 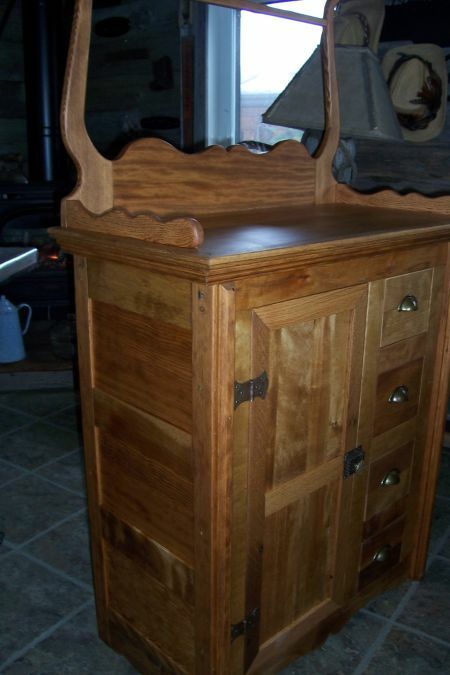 This washstand is completely my design and is not a copy of any existing washstand. Mon - Sat: 1:00 to 9:00 p.m.
Sun: 3:00 to 9:00 p.m. If something marked "Sold" catches your eye, don't despair. Wayne might be able to make you a similar item or already have something like it in the works. It never hurts to ask! Get in touch with a call or an email.